Or as 19th Century politician and writer Giuseppe Mazzini put it, “La Famiglia è la Patria del cure” – the family is the homeland of the heart. Youngsters crave excitement and adventure, while older holidaymakers tend to pine rest and relaxation. After visiting the south-eastern shores of Lake Garda a couple of times in the past, my wife Rachel and I know all about the area’s beauty and tranquillity. However, with our two growing daughters, Isla, 11, and Evelyn, seven, wanting more than sitting by a pool or lake and chomping on pizza and gelato, we headed back to Italy’s largest lake in search of family holiday equilibrium. Our hotel for the week was the luxurious Hotel Caesius Thermae and Spa Resort, set within lush landscaped gardens on the border of Bardolino and Cisano. Within its gated garden complex, there were five swimming pools for our children to explore, while inside the main building more mature guests can immerse themselves in the renowned spa centre’s thermal and Turkish baths and saunas. The buffet breakfasts were spectacular, with a massive array of fresh fruit juices, cereals, hot and cold dishes and that all-important cup of famously strong Italian coffee to get the day off to a rejuvenating start. Rachel and I had the antipasti, followed by the risotto and a veal cutlet with sage and potatoes, while the children had Parma ham with melon, smoked whitefish, noodle pasta and crunchy vegetables. 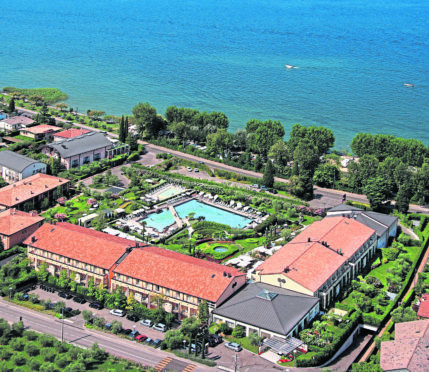 A few yards from Caesius is the promenade linking the beautiful resorts dotted around Lake Garda. With its world-famous wine and high-class shopping, Bardolino centre was a scenic 20-minute stroll away. We ate at Taverna Da Memo on Piazza Statuto, which I’d heard, served the best steak in Bardolino. Thankfully, the rumours appear to be correct – my tender sirloin was bursting with flavour. Back home, Isla’s passion is her swimming training. A few days into our break she was understandably having withdrawal symptoms so we drove her up to the Poiano Resort in the hills above Garda so she could make use of its Olympic-sized pool. As a treat for the girls (and mum and dad) we had a holiday within a holiday, and spent a night at the resort’s Adventure Hotel. We had a choice of rooms, all with a different exploration theme. But as the girls love anything snow-related, we agreed on the Arctic Explorer suite, complete with props of snowshoes, skis, Arctic crates and life-size pictures of polar bears and sea eagles. After checking in, we caught the shuttle bus to Gardaland itself. During summer, the park is open until 11pm every night and, as was becoming the norm, Isla twisted my arm and got me to join her on high-octane rides Blue Tornado and Shaman. We also got to see plenty of attractions as a family, with the new Peppa Pig Land and the Jungle Rapids the most memorable. After a hot day at the park, we settled down for dinner at the Ancient Egypt-themed Tutankhamun Restaurant, where there was a nightly visit from a mummy and his desert explorer friend. We had tasty prosciutto and cheeses followed by wood-fired pizzas and ice cream before heading back to the Arctic room to chill out for the night. As well as the Adventure Hotel and the adjacent Gardaland Hotel, the resort is now preparing its third themed accommodation – the Gardaland Magic Hotel – which is due to open in 2019. The next morning, we used our two-park ticket and made our way over to Gardaland SEA LIFE Aquarium, where we took a peek into the underwater depths and marvelled at its new arrival, the unusual Napoleon Fish. The best part of our previous Lake Garda trips has always been the long days spent by the lake itself and this summer was no exception. However, this peaceful bliss didn’t last, as the children soon wanted to hurl themselves into the lake from the boat slide. Kids will be kids, I guess. After everything we experienced on this wonderful holiday, it’s fair to say this amazing part of Italy remains the Jones family’s “numero uno”.